The synclavier follower up album for "Jazz from hell" was already announced in 1986 (see below), but it would last until 1994 that it would appear as the double CD set "Civilization Phaze III". The album did a lot to make good for Zappa's early death because of cancer in 1993. Rather than a reflection upon his career it's a big blast into new directions, with several high quality compositions on disc one and bizarre experiments on disc two. For these experimental parts Zappa included improvisations from the three live concerts with the Ensemble Modern, that make up 30% of the music. Speaking for myself I find it impossible to hear the difference between the notes that were humanly played and the synclavier notes, because the synclavier by now could work with sampled notes from the same instruments. For long "Civilization Phaze III" had the status of being Zappa's latest work. The existance of "Dance me this" was known from the beginning, but its release got delayed thus long, that the suggested implication was that this might be a less important experimental work. When this CD was finally released in 2015, its postponement turned out to be little more than a quirk by Gail Zappa. It's a masterpiece just the same. Some nuances should thus be made about Zappa's final works. It's a collection of projects. Some parts of "Feeding the monkeys at ma maison" and specifically the two synclavier works from "Frank Zappa for president" can be seen as part of Zappa's final output too. Here however it's getting difficult to know to what degree Zappa considered the dozens of existing synclavier pieces finished or worthwhile releasing. The synclavier from the mid-eighties onwards had achieved facilities as the possibility to enter weird irregular rhythmic groupings as applied in the "Get whitey" example from below. Between 1993 and 2000 the Ensemble Modern played several of Zappa's synclavier compositions (some note examples are included in an article by Erik Voermans in the Dutch magazine "Mens en melodie" ("People and melodies") of December 1995). "Get whitey" is included on the "Yellow Shark" CD of 1993. It's one of the more relaxing pieces of the album. This relaxing effect is formed by a strict 9/4 meter, where the underlying harmonic basis is mostly mixing the white keys of the piano. The notes of the melody are carried through the various instruments of the orchestra, like bars 1 and 2, given beneath (0:00 till 0:10 on the CD). Upon this comfortable basis solo instruments play erratic counterpoint figures in wild irregular groupings. Bars 15 and 16 are examples of playing 23 over 9 with various note durations (1:06 till 1:15). Such extreme rhythmic variation occurs more often in the later synclavier works. I don't know whether it's feasible to perform bar 16 exactly as this other than on a computer; at least the Ensemble Modern plays it a bit differently. Get whitey, bars 1 and 2 (midi file). Get whitey, bars 15 and 16 (midi file). Get whitey, bars 1 and 2 (notes). Get whitey, bars 15 and 16 (notes). 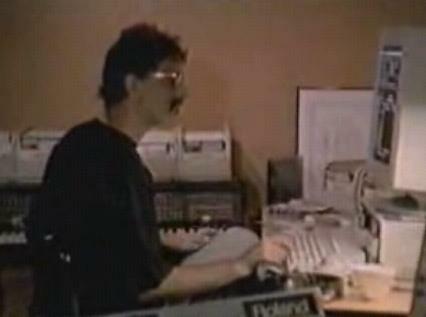 Right: FZ working on the synclavier (still from the "Ein leben wie ein extravaganza" documentary by Rudi Dolezal and Hannes Rossacher). "Civilization Phaze III" is problematic from the transcribing point of view. First because there are a lot of sound effects on the CD. The extent to which this is done in "N-lite" and "Dio fa" forms a new dimension in Zappa's music. The note notation system can only deal with sounds by giving each sound a staff of its own. When notes start to glide from one sound to another you would have to let this note fade out in one staff and come up in another staff. The score would become big and difficult to read. But mostly the problems stem from the fact that Zappa is here using different means for entering the music into the machine, because you can do it via typing in notes (as he mostly did in the earlier synclavier pieces) and by entering the music by playing it on a keyboard attached to the machine. Most music on "Civilization Phaze III" was never meant for human playing, so Zappa could do whatever he felt like without looking for a performable score. "Amnerika" is an exception, because in this specific form it was written for the "Yellow shark" program. During the years after Zappa's death, two employees of the Zappa Family Trust, Ali Askin and Todd Yvega tried to translate other pieces from the CD into performable score as well. They were successful for "Put a motor in yourself" and "A pig with wings", but attempts to convert "Xmas values" and "Buffalo voice" didn't work out well (according to the booklet accompanying the "Greggery Peccary & other persuasions" CD by the Ensemble Modern; below to the right a section from the CD cover, featuring a yellow shark and a piglet with white wings. ). It's possible however to score out anything by approximation when you don't have to bother about the readability. I can't approach most of "Civilization Phaze III" normally, but I find ignoring the album for that reason not an option either. Below are some sections that I could write out relatively normal, more or less, and several fragments that remain sketch-like, with approximate note duration lengths and sometimes without meters. The first three examples are taken from "Put a motor in yourself". This piece has a basis in E Dorian and is full of unusual harmonic movements, like parallel fourths and fifths, chromaticism and the formation of 9th and 11th chords. The first example shows the opening theme, that is played in parallel fourths and ends chromatically. In the previous printed versions of this site the examples were shorter and more sketch like. The Ensemble Modern however had the nerve to actually play this piece and put it on record in 2003. So I got convinced that it can be performed by humans, thus it also must be possible to score it out more accurately. It takes an awful lot of energy to do this, but indeed, with the help of the version for the Ensemble, I could go back to the synclavier version. The Ensemble Modern version namely has more clues in it for transcribing it. Their rhythm section, as far as you can call it that way in an ensemble, is more specifically ticking 16th notes and bass drum beats, indicating the meters. Put a motor in yourself, opening (midi file). Put a motor in yourself, opening (transcription). The opening presented here contains a number of varying meters, consecutively being 9/16, 10/16, 9/16, 6/16, 3/4, 4/4. It starts off with a vamp like figure with in staff three a motif that keeps being varied upon (except for one B the combination is E-G-A in various rhythmic figures). In staff 2 you've got a fourth (A-D) that keeps being played in a rhythmically irregular way. When the lead melody enters in the 2nd 9/16 bar it keeps being played as parallel fourths till it changes to three different intervals in the last bar. The lead melody in the bars with parallel fourths can be seen as part of larger chords similar to the two excerpts mentioned below. You can see parallel fourths turn up every once in a while in Zappa's music. His fondness of the sound of it goes back to his teenage years. In the Real FZ book he comments in chapter 2: "There were a few teachers at school that really helped me. Mr. Kavelman, bandleader on Mission Bay High, gave an answer to one of the burning questions of my youth. I went to him with a copy of "Angel in my life" - my favorite rhythm and blues tune from that time. I couldn't understand why I loved that record so much, but I thought that he as a music teacher might know. "Please listen to this", I said, "and tell me why I like it so much". "Parallel fourths" was his conclusion." Between 3:36 and 4:20 there's a section played in parallel thirds, fourths, fifths and octaves. The main melody here is forming mostly 9th and 11th chords, as indicated in two little excerpts below. There are other ways of grouping these notes, but the point remains that you'll find many enlarged chords. The melody is full of syncopes, only the drum part gives some grip on a meter. The bass is doing a counterpoint movement. Put a motor in yourself, 3:40 till 3:55 (midi file). Put a motor in yourself, 4:05 till 4:12 (midi file). Put a motor in yourself, sections (transcription). Both the Ensemble Modern version as the synclavier version are too irregular regarding drum beats to give any certainty about the meter notation for this last example straight from record. I can guarantee the duration lengths however. All three transcriptions in this study follow the "Civilization Phaze III" version. The score that Todd Yvega handed over to the Ensemble (not in my possession) is about the same, but has apparently a few 16th note lengths taken from one note to another. The score Todd printed out got arranged for the Ensemble Modern by Ali Askin and re-arranged again by Andrew Digby of the Ensemble Ascolta. It's this last version that is currently for rent at the Schott Music site. "Civilization Phaze III" is formally constructed like an opera, with the conversations by the piano people forming the scenario. Since this study is about music, I'm skipping comments on the tracks with these conversations, but I am following the numbering of the tracks with these episodes included. In the CD booklet the spoken parts are indicated with quotes, while the musical tracks are in bold. In this block tracks 1 and 3 are the piano people. Track 4, "They made me eat it", is a shorter composition with parts for piano, upright bass and drums. The irregular note strings by the piano are probably what Zappa refers to as synclavier sequences. In 2007 a German group of chamber musicians, the Ensemble Ascolta, performed two synclavier pieces from "Civilization Phaze III" next to two unreleased pieces from the archives (the link for their site is http://www.ascolta.de). See also below for "Samba funk". The known synclavier pieces were "Reagan at Bitburg" and "I was in a drum". No CD has been forthcoming from this event, so it has met the same fate as the Holland Festival. To the right you can see the ensemble performing "Reagan at Bitburg". The number of humanly performed pieces from "Civilization Phaze III" has thus been brought up to five, the other three having been executed and released on "EIHN" and "Greggery Peccary & other persuasions" CDs by the Ensemble Modern. Reagan at Bitburg, 1:16 till 1:41 (midi file). Reagan at Bitburg, 1:16 till 1:41 (transcription). Much of "Reagan at Bitburg" and in fact most of "Civilization Phaze III" has to do with rhythmic irregularity. At virtually no point you can clap to a beat for a longer period or sing along with the melody. "Reagan at Bitburg" begins with a slow melody, made up of long notes of varying durations. The middle block is fast. The transcription above shows a series of strings of 16th notes. Here the rhythmic irregularity is achieved by changing the meter almost every bar. Another thing you can see in the transcription is how it was prevented that a computer version becomes too much mechanical. Most midi files in this site suffer from this being mechanical. A note is there out of the blue with a perfectly constant pitch, which is unnatural. A normally played note needs a split second to catch its tone and never is perfectly constant. In case of the synclavier this was solved in the first place by loading humanly played samples into the machine. The synclavier became to support everything humans do, like vibrato and volume changes. Secondly Zappa used the entering of the notes themselves to give an execution more variation. At point a) in the transcription you can see that the two instruments, playing the lead melody, are setting in a little behind each other. At point b) an eight note is augmented with a 32nd note. At point c) the division of 16th notes is uneven for both instruments playing the lead melody, thus creating something jazz musicians call swing. All this combined makes the synclavier performances sound superb. I can't get near it with an ordinary midi file. "Navanax" has been transcribed by Andrew Digby for the WDR Symphony Orchestra, Cologne, and can be found at the Schott Music site. Tracks 6 and 8 are the piano people. Some bars of "Xmas values" are transcribed below. It features a hocketing ensemble over which one of the atonal note strings/sequences with irregularly jumping intervals is played. "Civilization Phaze III" is full of such sequences. See also "Igor's boogie, phase II" and the "I promise not to come in your mouth" riff for early examples of hocketing. Xmas values, 1:27 till 1:37 (midi file). Xmas values, 1:27 till 1:37 (transcription). The number of released synclavier pieces is only a fraction of the amount present in the archives in Zappa's vault. Quoting Steve Vai from the "Imaginary diseases" leaflet about the vault: "This plethora of unreleased recordings is so vast that even in the remainder of your on life ([...]), you will never get to hear all of it. And let's also not forget the some 400 Synclavier works that are in various forms of completion, securely buried in digital bliss...". Among these recordings was an at that moment still unreleased synclavier CD, entitled "Dance me this" and finished by Zappa himself in 1993. Track 10 features the piano people. - "Thing-Fish": "That evil prince". The first time Zappa used this melody. - Idem: "The white boy troubles". See the corresponding section for a little outtake as a midi file. - "Civilization Phaze III". The hocketing version with a little of its opening as a midi file below. - "EIHN". Same version, as performed live by the Ensemble modern. - "Frank Zappa for president". The vocal version. Amnerika, 0:00 till 0:10 (midi file). See below at the end of this section for a transcription of the opening in the vocal version. This vocal version is the one that gives the best clues for notating its meters. For that reason I would like to refrain myself to a note example of the vocal version, including only a midi file of the hocketing version and the fragment from "The white boy troubles". What you can hear in this midi file is that it starts differently from the vocal version. The notes by hocketing instruments form F-B-C as chord instead of F-Bb-C. The pedal notes are less explicitly present than on the vocal version, but this means that Zappa changed F major to F Lydian in the scheme I'm presenting at the bottom of this page. The score of "Amnerika" was handed over to the Ensemble Modern for inclusion in the "Yellow shark" program, but currently isn't on the list of scores for rent. "Religious superstition" is made up of a series of irregular arpeggio-like strings, played over a sustained B. Tracks 12 and 14 are the piano people. With "Buffalo voice" and "Get a life" the collage type of composing is getting the upper hand, which remains so for much of the rest of the album. Below are the first five bars from "Buffalo voice", lasting 5 seconds, thus being only a tiny fragment from the total composition. Nevertheless it gives some idea of the manner of composing. The entire piece is through-composed without returning themes. Instead it's a combination of sustained notes and shortes melodic movements, that keep varying all the time. The whole is atonal with irregular meters and rhythms. I could capture these opening bars in regular musical notation reasonably well, though to a point it remains my notational choice of course. Buffalo voice, bars 1-5 (midi file). Buffalo voice, bars 1-5 (transcription). In 2011 the ZFT came out with "Feeding the monkeys at ma maison" (see also below), containing an earlier much longer version of "Buffalo voice". Vaultmeister Joe Travers had called it the complete piece as written in 1986. According to Todd Yvega this requires some adjustment: "Frank rarely regarded any composition as completed, and often at the end of a long day of work at the Synclavier he would record the composition on tape, in whatever condition it was currently in, just to have a record of it and perhaps to use as placeholder material in a draft version of an album" (CD liner notes). So the eventual version shouldn't be seen as a shortened version, but as a different state. Tracks 16 and 18 are the piano people. - Note entry, as well as the possibility to print out scores as regular sheet music. The synclavier could be integrated in a recording studio. The machine supported irregular rhythmic grouping as shown above with "Get whitey". Another possibility was the sampling of acoustic instruments. One perfectly played note would be enough. The synclavier could transpose this note to all pitches. The machine was difficult to operate. Zappa worked in a team with Todd Yvega being responsable for the technical details. The set-up was expensive, but extremely powerful. Don Menn: "How do you resolve things in your music? How do you build and resolve? Is there a plan? FZ: "It depends on what kind of piece it is. And there are a number of ways you can enter the data into the Synclavier. One is to play it on the keyboard, another is to play it on the Octapad. You can type it in this obscure language called Script - which I don't know how to do - or you can type it in on the "G-page", which is just a stack of numbers, kind of like a phone book, or you can type it in in music notation, which allows you to see staves on a screen. So there's a lot of different ways to enter it. Depending on how you enter it, that makes a difference in how you develop whatever was there to begin with. Since I only have minimal keyboard technique, anything that I play in on the keyboard, I have to do it with the speed knob turned way down. Then do a lot of editing to it after it's been entered in. But all those piano parts on "N-lite" - you know these cadenzas and stuff? I played them." FZ: "That would be under "Industrial". It's completely broken down. Not only that, but I think we've got tens of thousands of samples by now, and you memorize their names. There's an eight-digit computer name for each of these things. I can sit there and watch the thing, and I can see the name of the sample, and I know what it sounds like. I know every one of those little bastards. I know how far it will travel on the keyboard all by itself. I know this stuff inside and out. To be able to write music for that kind of sound universe offers some major opportunities if you have the time to do all the typing to manipulate it properly." N-lite, 16:29 till 16:58 (midi file). N-lite, 16:29 till 16:58 (transcription/approximation). - 6:14 - 7:08 (first exposition). - 7:25 - 8:00 (variation #1). - Bars 1-2: Part of the main theme, at this point in a G major type of key. It's a slow melody with two keyboards alternatingly playing it from different corners in the stereo field. - Bars 3-5: Chord progression, that closes the main theme. These chords don't belong to one or more particular diatonic scales. - Bars 6-7: Now I can't transcribe this music with certainty anymore in standard notation. It's only by approximation. The basis is a bass pedal notes movement, over which keyboard sequences are played. As Zappa explained above, it's played by himself and sped up. These two bars are atonal and a mixture of three keyboard parts. - Bar 8: This is a sequence not only in the meaning of a string of notes, but also in the classical sense. After four pick-up notes you can see a figure being repeated four times, starting at different pitches. It's a sus4 chord. At the end of this bar the sequence chain gets broken in the sense that it evades to notes from a different scale, but it's still a F#sus4 chord. - Bar 9-10: The speed remains pretty high. After gradually slowing down a little towards the end of bar 8, Zappa continues with a descending string. It's made up of stacked fourths and sus4-chords, thus forming non-conventional chords. The whole is diatonic, A Mixolydian with a heavy A as pedal note. Zappa himself used the word cadenza for bars 8-10. In bar 10 the music comes to a pause with a low sustained bass B with a mezzo-piano Eb in the descant. In "Secular humanism" the recorded sound samples are more important. This composition already existed in 1986, at that time lasting 6:37 minutes (as released on the "Feeding the monkeys at ma maison"). The 1994 edition is much shorter, lasting 2:41 minutes. Tracks 1, 3 and 5-7 are the piano people. - Bar 1: a lower bass F, followed by higher Ab. Sometimes there are slight inequalities between parts. The Ab is played on two upright basses. One plays it as a mini-arpeggio with F-Ab. - Bar 2: similar to bar 1. The F note lasts a little longer. Since the rhythm is only estimated, I can't positively comment upon the meter and note durations. To a degree it's my notational choice. - Bar 3: the figure gets extended to F-Ab-G-F. The last F glides down to an Eb. - Bar 4: this figure in a different rhythm. - Bars 5-6: this figure again in yet another rhythm. - Bar 7: just F-Ab-G. Every bar has the rhythm somewhat changed. - Bar 8: F-Ab-G again, but with an additional bass D. The music of this section can be interpreted as diatonic, following a minor type of scale. So far it would be F Dorian, but the Db from bar 9 lets it switch to F minor. - Bar 9: Db-F-Ab. Another variation upon the cell, including a melodic change by using an Db. I was in a drum, 0:44 till 0:59 (midi file). I was in a drum, 0:44 till 0:59 (transcription/approximation). What I'm doing here is not transcribing anymore in its regular meaning. Instead of noticing with certainty what the pattern is, it's only estimating the lenghts of the notes and trying out some values in order to get to a midi file than can be played reasonably equal with the CD. It's not unique. Other notations can be done to get it acceptably equal as well. This is only 15 seconds of a piece that lasts 3:38. It took me a day to set this up and it's not really enjoyable work to do. The whole composition would take up 15 days to get it on paper doing it in this manner. In order to have it performed by human beings, such a score has to be "normalized" towards a performing score. This has been done by Andrew Digby of the Ensemble Ascolta. They transcribed "I was in a drum" and "Reagan at Bitburg". Next they contacted the ZFT and got permission to perform these pieces, next to "Samba funk" and the "Overture to Uncle Sam". A couple of transcriptions/arrangements by Andrew have an authorized status and can be rented via Schott Music under the same conditions as the other official Zappa scores. Though released in 1994 it looks like "Civilization Phaze III" was fully prepared in 1993, cover and all. I'm also getting the impression that Zappa had fixed the release date as for 1994 in his will, while the ZFT was given a choice for when to release "Trance-fusion" and "Dance me this", including the cover art. In case of "Civilization Phaze III" it was done by Uri Balashov and Command A Studios Inc. The front side shows a piano in flames, the backside is inspired by ancient Egyptian figures and signs. 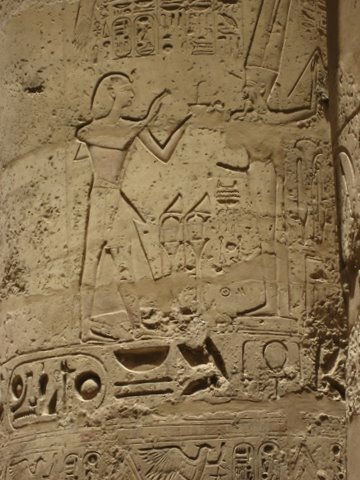 To the left a part of one of the many columns of the temple of Luxor (photo by KS). To the right an outtake of the backside construction from the CD. 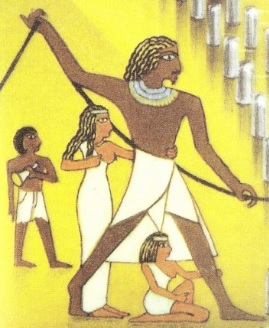 It doesn't directly refer to the little play and the piano people, that is the piano doesn't get in flames during the plot, nor are there any references to ancient Egypt. On page three of the "Civilization Phaze III" booklet Zappa states that all of act one is synclavier music and that the second act is combination of 70% synclavier music and 30% live performance. On page 31 the members of the Ensemble Modern get listed. Not just the ones participating as piano people. The implication thus is that the ensemble is to be credited for playing part of the music. In case of "A pig with wings" the ensemble proved their ability to play this on their "Greggery Peccary & other persuasions" CD. A performing score must thus exist. It's an interesting piece with arpeggio-like figures for a wide range of snare instruments. Track 9 is the piano people. A pig with wings (Civ. ph. III), 0:43 till 0:48 (midi file). A pig with wings (Ens. Modern), 1:16 till 1:29 (midi file). A pig with wings (Civ. ph. III), 0:43 till 0:48 (transcription/approximation). A pig with wings (Ens. Modern), 1:16 till 1:29 (transcription/approximation). The first example is a section from "Civilization Phaze III". Playing it literally as it goes on CD is undoable. You've got a number of snare instruments with their notes appearing in different sections from the stereo field, playing through each other. It's rhythmically irregular and there are no clues in it for where to put the meter lines. This first example can be no more than an approximation with the dashed meter lines only being present to have some form of a time unit. Its main ingredient is an arpeggio-like figure that is getting varied upon: A#-E-F-G#-B-E. Notes can get skipped and the notes of the figure can get played by different instruments, like during beat 1. Beat 5 offers an alternative downwards figure, appearing only once, to a point like the areggio figure being played backwards. This first example has some value for creating a midi file and describing what's happening, but it's unrewarding as it comes to setting up a performing score. Then it has to be normalized. The Ensemble Modern used a score constructed by Todd Yvega and Ali Askin. On their CD you can hear this section between 0:58-1:07, being played by a harp alone. The performing score concentrates on the arpeggio figures. The second example is transcribed from the Ensemble Modern CD. Now it does look more feasible to play it like this. Again an arpeggio figure is getting varied upon, this time G-D-C#-E-G-A#-D#. In its tail it's the previous figure, transposed a minor second down. The rhythm and, quite outspokenly, the tempo is used as a means to create these variations. For bars 5-9 I've indicated these fluctuations as to be played with "much rubato", in other bars I'm more precise. It corresponds with the "Civilization Phaze III" version, 0:51-0:59, where it's played thus fast, that it's getting hard to discern each individual note. The whole piece had to be played slower to make it humanly performable: 4:25 versus 2:52 on "Civilization Phaze III". "Hot & putrid" sounds as a directed improvisation, probably belonging to the 30% live recordings. It's a short piece with two of the piano people being overdubbed. It opens with a clustered dissonant chord, F-C-B-F#, starting in a sort of arpeggio manner by a number of instruments. The meters and rhythms are all by approximation. During bars 2-4 the Spider character from the piano people speaks along a vibrating A-G chord by the strings. This chord swells and diminishes again. Bars 5-6 begin with a gong beat. The clarinet leads with playing an A in an irregular rhythm. A piano and a oboe are playing along with some notes, mostly less loud in the background. The whole is chromatic. Hot & putrid, opening (midi file). Hot & putrid, opening (transcription/approximation). Tracks 11-12 are the piano people. In the Zappa! issue of Keyboard and Guitar player, page 11, Zappa explains that he did a series of such directed improvisations, calling them clusters: "The clusters are experiments that were conducted with the Ensemble Modern in July of 1991. I would just make things up, we would experiment and, if it sounded good, keep it; if not we'd dump it. Each musician had a piece of paper, and he would write down whatever the instructions were for his particular instrument, and Ali Askin collected those things and summarized them." The example above of "The (unanswered) cluster" is a sample reproduced in Zappa!. The (unanswered) cluster, sample 1a (midi file). The (unanswered) cluster, sample 1a (score). My midi editor has insufficient capacities to represent this music properly. Both two midi files from this paragraph are rather rough compared to the score. This example from the "The (unanswered) cluster" series features a pulsing clustered chord, starting pianissimo to gradually become fortissimo. Each staff is adding elements to this in a different manner. Over this a motif of four notes is played twice by two different instruments. These instruments aren't indicated, but by putting their notes in different staves, not being grouped, the score suggests that they should sound differently. As it comes to the rhythm, the score is a bit sketch-like. Be their position you can see that the rhythm of the motif should not coincide with the rhythm of the pulsing chord, as well as that an eighth note in staff two lasts longer than an eighth note in staff one. This example is chromatic. Not only is the chord indicated as such, the four notes of the motif don't belong to a diatonic scale neither. "Gross man" belongs to the abstract atonal works from Zappa's later output. It's through-composed with very irregular melodic lines and, to a lesser degree, irregular rhythms. Much of it sounds as a clarinet solo with a smaller ensemble to accompany it. While the melody from staff 3 is largely following the eighth note as a time unit, the melody from staff 1 (the clarinet) is more versatile. In bar 3 the quadruplet, followed by a triplet and 16th notes, cause an acceleration effect. To a point the meters are my notational choice. Gross man, 0:17 till 0:29 (midi file). Gross man, 0:17 till 0:29 (transcription/approximation). The piece is using various styles, with the example from above being only a smaller outtake. Bars 1 and 3 from this example are using counterpoint figures. Bar 2 contains a single melody played over a sustained A. Bar 4 is mixed. Bars 5-6 feature a sustained Bb by the bass with some piano arpeggio chords. Again bars 5-6 are an approximation. Especially the notes from the clustered dissonant chord from bar 6 are difficult to identify with certainty. Track 14 is the piano people some more. After the atonal frenzy of the previous tracks, the diatonic atmosphere of "Why not?" sounds welcome. It's a beautiful piece, but rhythmically quite irregular. Again I can't get at a normal meter notation, using dashed lines instead to reach some form of readability. "Why not?" is another example of Zappa's search for harmonic diversity. Pedal notes and keys keep changing and the chords can very between triads and larger uncommon chords. This idea gets a continuation in the second half of "Piano" from "Dance me this". Both "Why not?" and "Piano" have a piano as the central instrument. With the tempo changes and varying note lengths in the example below you can also see the irregularity of the rhythm, something which runs all through "Civilization Phaze III". Why not?, 1:15 till 1:25 (midi file). Why not?, 1:15 till 1:25 (transcription/approximation). - "Bars" 1-2: C minor type with both the B and Bb turning up. Because of the sustained notes, broad chords are being built up. - "Bar" 3: E Dorian. - "Bars" 4-5: The pedal note switches to B, that you could call step V of E Dorian. - "Bars" 6-7: An E altered to Eb turns up at the end of bar 6, being sustained in bar 7. In bar 7 a chromatic chord can be heard over a G pedal. With "Dio fa" the atmosphere changes yet again. Much is made up of layers of alternating sustained notes and chords, some samples sounding as electronically mutated human vocals. Tracks 16-18 and 20 are the piano people for the last time. With the titles of the last two pieces on disc II - "Beat the reaper" and "Waffenspiel" - Zappa is in all probability referring to his approaching death. "Waffenspiel" is German for game of arms by the way. But there is nothing of a fight going on in these compositions. They are gentle ongoing improvisations, where you can imagine Zappa lying in his sick bed listening to the sounds from outside and thinking of new music. In the CD booklet he calls it sounds from outside the piano. All through "Beat the reaper" it's raining and we hear a car departing. "Waffenspiel" is a collage of sounds of things happening outside, like construction work, birds singing and an airplane flying over. Barry Miles describes Zappa's last days in his biography and as it appears Zappa died in peace surrounded by his family. Next are two fragments from "Beat the reaper". The first is in a strict tempo, that I could transcribe normally. The second example remains a sketch only. It shows on a very small scale the mixture of hocketing (leading a melody over various instruments), counterpoint and harmony, that Zappa often used in his late works. It is present in a far more complex form in pieces as "Xmas values" and "While you were out II" from "Jazz from hell". The second "Beat the reaper" section is a sketch, taken from the emotional section half through, that has one of the sound effects in it. The melody is namely played by three instruments that are coming up shortly after each other. Beat the reaper, 2:19 till 2:34 (midi file). Beat the reaper, 12:43 till 12:52 (midi file). Beat the reaper, fragments (transcription/approximation). The following is Zappa talking about this music, though not exactly in the shape as how it finally landed on the CD. He comments in Zappa!, page 42: "About a month ago, we finished something that I've been working on for 10 years; it's 24 minutes long. It sounds like an orchestra piece, but it's an orchestra like you never heard before. You couldn't get an orchestra like this. Not only do you have all normal orchestral-sounding instruments - the piano, percussion and the rest of that stuff - but it has any known kind of synthesizer noise built into it, plus vocal sound effects and car sounds and all this stuff organized into basically a diatonic composition. I've been working on this thing for years and years and years, and every time a new sample comes along, it would go into this thing. That's going to be the centerpiece of the second disc." 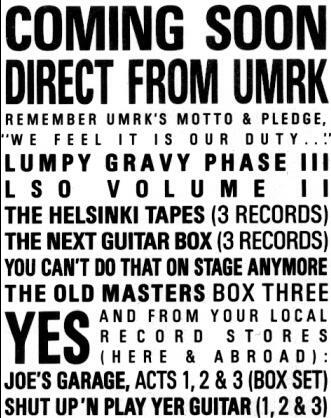 To the left a section from an advertisement sheet from 1986 by Barfko Swill for the upcoming album releases. The first mentioned is "Lumpy gravy phase III", as what would have been the follower up for "Jazz from hell". The others albums were actually released in 1987-8. The title implies that the idea of including more from the piano people conversations from "Lumpy gravy" already existed at this stage. "Civilization Phaze III" contains both the piano people from "Lumpy gravy" and new recordings with Moon and members from the Ensemble Modern. A selection of synclavier works from 1985-6, called "Resolver + Brutality", is known via a cassette tape copy, that Zappa apparently gave to one of his collaborators. Visit http://www.afka.net/resolver-brutality.htm for images of the cassette and the tracklist. It has Zappa's handwriting on it and is made up of collages like "H.R. 9211". It got out of the studio and landed in the bootleg circuit without any information about its provenance, which indicates that Zappa didn't intend this to happen. It's made up of two larger collages and some smaller ones, that include more from the Senate's hearing from 1985 as presented before on "FZ meets the mothers of prevention". In 2011 the ZFT came out with the content of another tape, titled "Feeding the monkeys at ma maison". According to Gail Zappa it's the master tape of what could have been an album release. This one also has the title on it in Zappa's own handwriting. The title track is the same piece as "Resolver ED" from the cassette, thus now officially available with the best sound quality. The other two tracks are earlier states of two pieces from "Civilization Phaze III". Samba funk, opening (midi file). Two things are thus certain. First, Zappa had the material for an album release at hand in 1986 and considered releasing it seriously. Secondly he did not actually release this material till 1994, continuing to work on it for years. In my opinion Todd Yvega then accurately depicts the material from these tapes as work in progress in the CD booklet. Apart from the tape, "Feeding the monkeys at ma maison" contains two more tracks. "Worms from hell" is a coherent composition. Two smaller sections from this piece got already used before. One for the opening of the "Video from hell" video. The other section is part of the "Electronic music by FZ", that can be heard during the Peefeeyatko documentary (see the penultimate section). 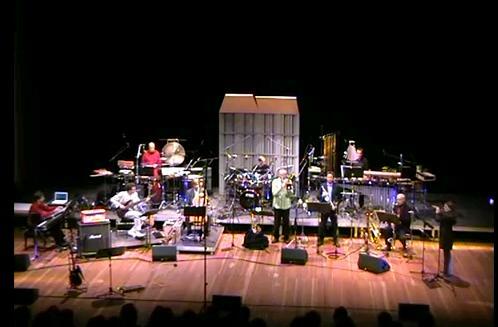 The second track is called "Samba funk" and got premiered by the Ensemble Ascolta in 2007. More than the pieces from "Civilization Phaze III", this song is fit for human performance. The above transcription of its opening for instance has a steady 4/8 meter. This part contains relatively slow melody sections alternated with sudden fast strings with irregular groupings. Between the two fast strings of bars 6 and 15 you have a number of bars with only drum beats. Harmonically this piece can be seen as either polyscale (with tiny scale fragments), or atonal altogether. Zappa avoids dissonants in the chords, thus the whole sounds friendly. 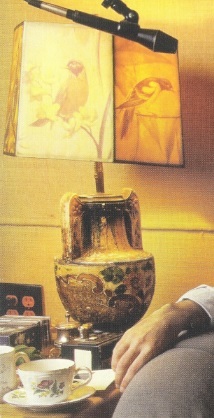 Part of a photo of The vault (photo by Alex Winter) and part of the inner CD photo (by Dennis Keeley), featuring the same (type of) lamp in different settings. With the Zappa house being sold, things like this are becoming a bit of nostalgia. As it comes to releasing new material, "Frank Zappa for president" is a major contribution to Zappa's output. The opening piece, "Overture to Uncle Sam" is a 15-minutes synclavier piece. In the "Dance me this" liner notes, this work gets mentioned as a piece Zappa was working on in his last year. Other than "Feeding the monkeys at ma maison", that has the character of work in progress, the "Overture to Uncle Sam" sounds as a finished composition. It's a carefully constructed piece with a couple of themes/motifs, that continuously get varied upon. 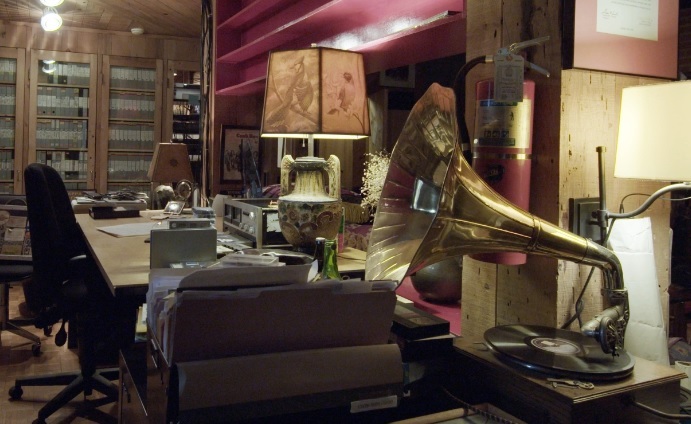 The sounds belong to the set of sampled sounds from real acoustic instruments. The music gets led over various groups of what you could call a chamber orchestra. It's based upon note entry and has been partly performed as such by the Ensemble Ascolta in 2007. Andrew Digby wrote me that they have the first 6 minutes on paper, while still working on the complete piece (status November 2016). Their site contains a sound example (see above at "Reagan at Bitburg"). Two more synclavier pieces are included on this CD. "Medieval ensemble" is an earlier work. It's atonal and a rather wild example of Zappa applying counterpoint. Both pieces are pretty interesting technically as well, because, yet again, news facets are added to Zappa's reportoire. Overture to Uncle Sam, 10:41 till 10:52 (midi file). Overture to Uncle Sam, 11:09 till 11:16 (midi file). Overture to Uncle Sam, sections (transcription/approximation). Above are two fragments from the "Overture to Uncle Sam". Both are largely duets. The first between a "bassoon" and a oboe. I have to put the indication bassoon between quotes, because it's getting higher than the range of a real bassoon allows. This is played at the beginning of the part, where counterpart movements are getting the upper hand. This little example is atonal. It's free counterpoint with two melodies interacting. It's starts in 2/4, after which the meters are getting to vary. The second fragment is a duet between two violins. Again this example is an approximation only as it comes to the rhythm. The sound involves another combination from the chamber orchestra, strings versus the woodwinds from above. Stylistically it's also quite different. This snippet contains diatonic material, though not having a specific tonic or following one particular scale. The set-up is homophonic with the second staff offering harmony notes below the lead melody from staff 1. In bar 5 stereo effects are used to let the notes of the music come from different parts of the stereo field. It's indicated as M-R-L in the example, middle-right-left. Much relevant is also the vocal version of "Amnerika". While the melody of the instrumental version from "Civilization Phaze III" is accompanied by quickly hocketing instruments, this one has chords and bass pedal notes. As a surprise it also has lyrics, sung by Napoleon Murphy Brock. So it must stem from around 1983, when Napoleon was back in the studio with Zappa for recording a couple of tracks for "Thing-Fish". This latter CD is also the first time parts of the "Amnerika" melody appeared on CD. See the corresponding section with a fragment from "The white boy troubles". To the right an outtake from the CD booklet with an imaginary "Zappa for president" sign in front of a government building. Around 2005 Tom Trapp wrote me about some notational errors in my "Echidna's arf (of you)" example. At that time his site contained two transcribed examples from Zappa pieces. One was the opening of "Amnerika". It looks like the vocal version was already circulating, because it's this version that Tom transcribed. Below is my transcription of the opening bars from "Frank Zappa for president", where I could use his example as a starting point. Amnerika (vocal version), opening bars (midi file). Amnerika (vocal version), opening bars (transcription). 0:00 F pedal with the Fsus4 chord. The song begins in F major. 0:07 E pedal with the Am chord. 0:13 F pedal with the Fsus4 chord. 0:20 E pedal with the Am chord. 0:26 Eb pedal with the Ab chord. Modulation to Eb major. 0:32 D pedal with the Gsus4 chord. Modulation to D minor. 0:38 F pedal with the Fsus4 chord. Back to F major. 0:43 E pedal with the Am chord. 0:49 Eb pedal with the Ab chord. Modulation to Eb major. 0:55 D pedal with the Gsus4 chord. Modulation to D minor. 1:02 C pedal with the Gsus4 chord. Modulation to C minor. 1:07 F pedal with mostly the Fm chord and sometimes the Em chord. Modulation to nominally F minor. 1:18 E pedal with the Em chord alternating with Eb pedal with the Eb chord. Indecisive. 1:31 D pedal with the Gsus4 chord. Modulation to D minor. 1:34 Till the end this whole sequence gets played again instrumentally.